Nitrogen-containing bisphosphonates (N-BPs) are important drugs widely used in a variety of bone resorption diseases. These compounds target the farnesyl pyrophosphate synthase (FPPS), a key enzyme of the mevalonate pathway involved in several pathologies. 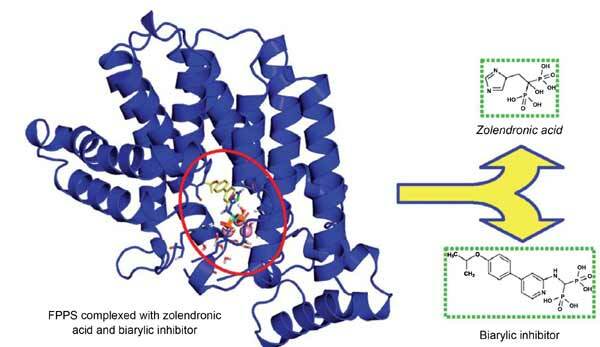 The inhibition of FPPS is a promising pharmacological approach and the development of structure-based methods for the prediction of the enzyme-inhibitor binding energy, can provide a guide for the rational design of new N-BPs. In this study multiple docking and post-docking strategies were applied to develop an effective computational workflow able to correctly predict the binding geometry and energy of a diverse set of known N-BPs. Preliminarily, we identified a model structure of the target allowing to predict the binding pose for all studied ligands and improving the estimation of the target-ligand interaction energies. A significant correlation between calculated and experimental binding affinities was found by dividing the whole group of N-BPs inhibitors into two subsets according to the structure's size, suggesting that the contributions to the binding energy are differently weighted in the two groups and that the FPPS inhibition mechanism may be based on ligand dimensions. The ob tained quantitative models can be further exploited for either screening or optimization studies of newly designed N-BPs. Bisphosphonate, docking, FPPS, MM-GBSA, post-docking refinement. Dipartimento di Farmacia, Università “G. d’Annunzio” Chieti, Via dei Vestini 31, 66013 Chieti, Italy.